Woodford Reserve is a bourbon that has helped reshape the whiskey's image over the last few decades. It is one of the newer brands, though it is produced at one of Kentucky's oldest distilleries. While each whiskey drinker certainly has their own opinion on which is the best, few will argue that Woodford Reserve is one of the finest bourbons in the world. You are not likely to find two bourbons that taste alike and this is what is so fascinating about this style of whiskey. Woodford Reserve, however, is even more unique due to a few aspects in particular. First of all, it begins with a mashbill that includes 18% rye, one of the highest concentrations in the bourbon industry. This gives the whiskey a nice spice that is contrasted by its extreme smoothness. The rest of the mashbill is 72% corn and 10% malted barley. It is also distilled primarily in pot stills versus the more commonly used column stills. Additionally, it is aged in stone warehouses to better control the maturation process. It spends about 7 years in new, charred, American oak barrels. After that, the pot and column still whiskeys are blended to create the bottled whiskey at a strength of 40% alcohol by volume (80 proof). Many whiskey drinkers agree that this is a full-bodied bourbon which is exceptionally smooth. It does not have the fiery bite of some of its counterparts and this is either appealing or not. For someone who is new to bourbon—or who favors lighter spirits like vodka—Woodford is a great place to begin. Then again, those who enjoy the more robust whiskeys may find it a little dull. It's staying power in the market and countless awards over the years provide evidence that Woodford Reserve is one of the greatest American bourbons produced. It is also an exceptional value in the world of whiskey and one of the best bottles to grab when you're looking for an impressive whiskey cocktail. 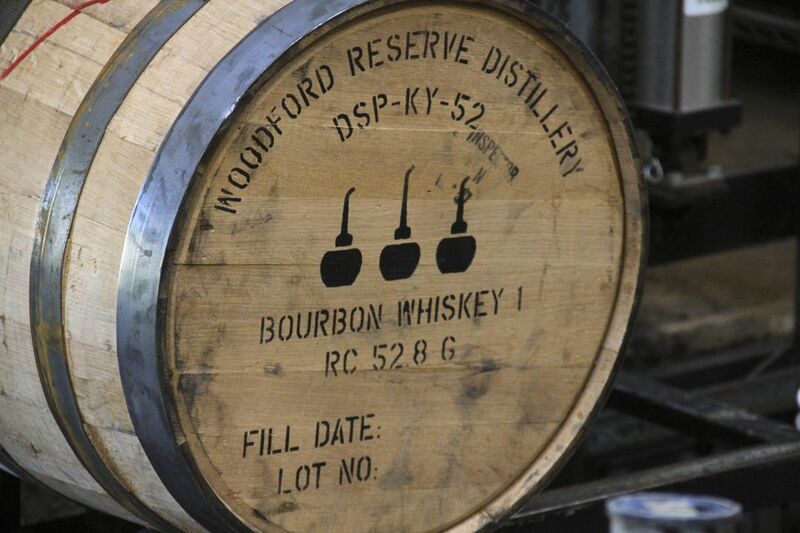 The Woodford Reserve brand was launched in 1996, so it's relatively young in the bourbon world. However, the history of the distillery itself and it impacts on the distilled spirits industry date back to 1812. It was in that year that the first log cabin distillery was built on the site by Elijah Pepper in Versailles, Kentucky, which is located in Woodford County. In 1838, the Pepper Distillery was taken over by Elijah's son, Oscar. He would go on to produce Old Oscar Pepper Bourbon and the original Old Crow Bourbon with Master Distiller Dr. James Crow. As is customary with the oldest bourbon distilleries, the brands produced on this site have changed often over the years (an average of four brands in a distillery's lifetime). What is now the Woodford Reserve Distillery was no different. Today's resident brand of the historical distillery pays homage to this heritage with the name Labrot & Graham (another bourbon produced just before Woodford Reserve) on every bottle. Brown-Forman purchased the distillery in 1940 and still owns it today. Now a giant in the liquor industry, Brown-Forman's legacy began with Labrot & Graham. In the last part of the century, they decided to modernize the bourbon distilled there, leading to the development of Woodford Reserve Bourbon Kentucky Straight Bourbon Whiskey. Master Distiller, Chris Morris, is not a generational distiller like many of his counterparts. He did grow up in the industry, though, as both his mother and father were distillery employees. Morris himself has worked with Woodford Reserve since 1976 and took on his current role in 2003. He has been responsible for continuing the signature taste of the brand's flagship bourbon as well as developing special bottlings. These include Woodford's Double Oaked, Rye, and each of the Master's Collection bourbons, which are an annual release. These often introduce new ingredients and interesting barrels to the bourbon, offering an intriguing taste of the possibilities whiskey holds. On the nose, Woodford Reserve features a distinctive aroma of freshly baked banana bread that instantly identifies this bourbon as none other than Woodford. Notes of oak, dark chocolate, cinnamon, and orange also appear, creating a bouquet that is both appetizing and rich. Woodford Reserve has a full, rich mouthfeel but it is balanced so perfectly that it also mixes well in cocktails. Super smooth, the flavors of cinnamon, walnut, and allspice complement both the oak and vanilla tones imparted by barrel maturation. Dark chocolate and orange marmalade notes also caress the palate, while a certain rye spiciness adds a bit of flair to the overall flavor profile. In two words, this whiskey is utterly delicious. On the finish, Woodford Reserve offers a long, spicy and satisfying finish. Hints of tobacco leaf, rye spice, and mint appear before giving way to oak notes and a subtle and elegant floral before leaving the palate. All in all, Woodford Reserve is one of the greatest whiskeys in the world and an icon in the world of bourbon. A great value at its price point, which floats around $30 per bottle, Woodford Reserve is both affordable and truly luxurious. Keep a bottle at home for sipping and certainly don't be afraid to mix it into any bourbon cocktail. Also, if you keep this bourbon at the top of your list for gift giving, you'll never go wrong. Woodford Reserve is truly an American masterpiece.